I’ve previously posted in general about the Ed Bearss Petersburg troop movement maps, and specifically about the Bearss Crater troop movement maps. In the initial post, I shared several zoomed in sections of the first map focusing on the October 27, 1864 Battle of Boydton Plank Road. There are over 60 maps in all, including around 10 or so base maps, and then accompanying troop movement overlays. The maps were scanned at a diagonal angle, meaning they need to be rotated, cleaned up, and then overlaid properly. My lack of artistic talent meant this process would take a long time, in addition to the work I’m doing behind the scenes here preparing for the Ninth Offensive in March-April 2015. Since the original post, I’ve luckily recruited some help. Rich Hasenauer, a retired graphic artist who has moved on to creating Regimental Fire and Fury scenario books in his newly expanded free time, has agreed to lend his considerable talents to this project. He has managed to finish the maps for Boydton Plank Road, the Crater, and Hatcher’s Run in just the last few days alone. Although I’m still sticking to my timetable of releasing these one per day starting in mid-April 2015, I will at least whet your appetite in the interim. Today we are going to look at the very little known Battle of Fort Mahone (part of the larger April 2, 1865 Third Battle of Petersburg), in which John Parke’s Ninth Corps, Army of the Potomac, bizarrely attacked what was considered to be the strongest Confederate position along the lines east and southeast of Petersburg. Fort Mahone, also known colloquially as Fort Damnation, was set out in front of the main Confederate line just west of the Jerusalem Plank Road. This section of the Confederate line was defended by elements of Gordon’s Second Corps, Army of Northern Virginia. John B. Gordon exercised tactical authority over this portion of the Confederate line, his men still in the area since the March 25, 1865 Battle of Fort Stedman. This zoomed in shot of the Fort Mahone area shows the Second (Potter) and Third (Hartranft) divisions of Ninth Corps, Army of the Potomac, lined up and preparing for the attack up the Jerusalem Plank Road. The fact that the troops could align on the road itself in the darkness is one theory posited for Parke’s decision to make the attack here. Click on the map below to see a zoomed in version with more detail. 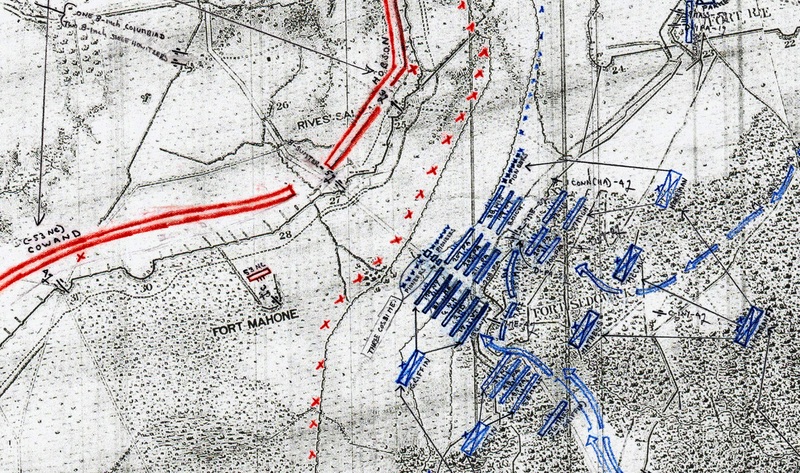 Parke’s assault managed to gain a foothold in the Confederate trenches, including Fort Mahone. But John B. Gordon soon had reinforcements on the way, desperate to expel the Federals and restore the integrity of their line. This second and last map teaser for today features Bryan Grimes’ Confederate counterattack at 3 pm on the afternoon of April 2, 1865. Gordon had to pull men from elsewhere on his thin lines to attempt an ejection of the Union forces gamely holding onto a section of his works near Fort Mahone. As above, feel free to click on the map below and zoom in even more. I hope you enjoyed this teaser. There will be several more between now and the end of the Siege of Petersburg’s 150th anniversary observances here at the Siege of Petersburg Online. And stay tuned for the full maps, available in a variety of download sizes, one appearing per day, starting in mid-April 2015. I look forward to freely sharing these amazingly detailed maps with all of you, and I can’t wait to get your reactions. Thanks for posting these excellent maps. They help to clarify the action on a confusing and little-discussed area of the battlefield that unfortunately has been paved over for decades. I’ve written a post on the 9th Corps attack which should appear on the New York Times Disunion blog tomorrow. You’re welcome! I’ll be posting the full size versions sometime in April or May. 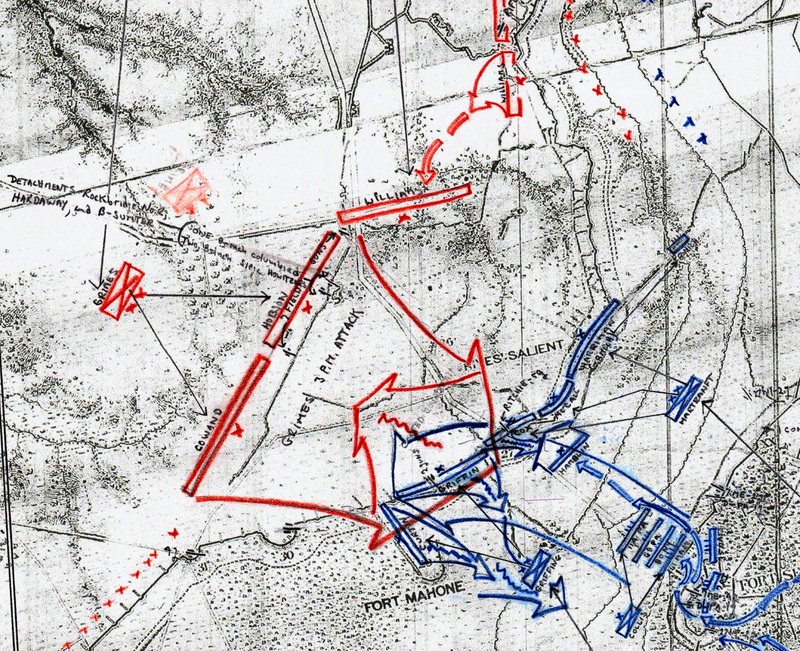 There are, if I remember correctly, 5 or 6 maps depicting the ebb and flow of Parke’s April 2 attack. Looking forward to your article.